The few cooking groups that I belong to are really educative. I have learnt new techniques, more about world cuisine, a bit more about other countries and its fun to see the photos of fellow bloggers. The same recipe turns out quite different in different hands. If it weren’t for these groups I don’t think I would have tried out different sorts of breads or baked goodies. I would have probably stuck to the more familiar recipes. Sometimes time does not permit me to bake on time but I do finish the challenge before the month ends. A lot of research goes into challenging the groups to a certain recipe.Research by both the one who sets the challenge and also by the ones who take up the challenge. For the month of May Gayathri challenged the baking eggless group to a Kugelhopf. 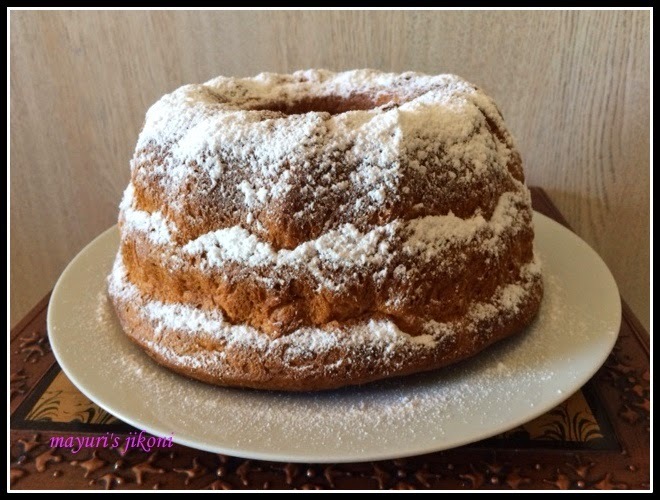 What is a kugelhopf?Kugelhopf, kougelhopf, kouglof, gugelhuph, is a yeast bread popular in parts of Germany, Austria, Switzerland, Croatia, Serbia, France, basically many parts of Central Europe. The slightly sweet yeast bread is served with coffee and can be orange or lemon flavoured with dry fruits in it like candied mixed peels, raisins, almonds etc and spices. Sometimes it may contain brandy. Its usually baked in a fluted pan with a central tube, much like the bundt pan. Traditional kugelhopf pans were made of enameled pottery. The outside part of the bread is lightly browned with a subtle crust and the inside soft and spongy much like a brioche. read more about kugelhopf here . Depending on regions, its served with coffee, or at breakfast or even dessert. Whenever or however it is served, this bread is absolutely delicious, soft, sweet and flavourful. Mine disappeared really fast. Do you love baking? Do bake at least once a week? Mix flax seed powder and water. Let it rest for 10 minutes. Put flour, sugar,salt, baking soda and yeast in a mixing bowl. Add the flax seed mixture and milk to the flour. Mix the dough on medium speed on your dough kneading machine or by hand for 6-8 minutes or till the dough is smooth and elastic. Add a little flour if the dough is too sticky. Don’t add too much, add about a tablespoon first. Add the butter little by little and knead the dough on medium speed for another 5-7 minutes or by hand. If you are kneading the dough by hand, then you may need to add a little extra flour if the dough is too sticky. Lightly grease a bowl. Form the dough into a ball and place it in the bowl. Cover the bowl and place it in a warm area. Let the dough rise till it is double the size.Mine took about 1½ hours. Grease a bundt pan lightly. Place almonds in the groove if you want to. Gently knead the dough and add the mixed peel or dry fruit. Knead it into the dough. Roll the dough into a ball. Make a hole in the middle of the dough. Place the dough in the bundt pan. Put the pan in a warm place and let the dough rise till its double the size or for 45 minutes. Preheat the oven to 180°C. Keep a piece of aluminium foil to cover the pan ready. Brush the top with milk. Bake the bread in the oven for 25 -30 minutes or till a knife or skewer inserted in the bread comes out clean. Check the bread after 10 minutes. If the top has become brown, cover the pan with the foil and bake for further 15 -20 minutes. Let the bread cool in the pan for 10 minutes. Remove the bread from the pan and let it cool on a wire rack. When it is completely cold, dust the bread with icing sugar and serve with some butter. If you are using dried fruit like raisins, prunes, etc, soak it overnight in brandy or orange juice.Drain out the excess liquid before using the soaked fruit. Can add chocolate chips or cocoa powder to the dough. If you want to replace the flax seed with egg, then use one egg. Do not add the baking soda. You may need less milk. What a lovely looking bread that looks really delicious almost like fruit break. I love baking .. specially breads. will try this one soon too. U baked very well.nice pics..